The hunt for roe is best to open in early October . The key to the success of this campaign is a thorough study of the habits of the animal, its habitat. From a large number of ways to hunt, you must choose the right one for a specific situation. The important role played by the weapons used in this . Roe deer is one of the most beautiful animals on the planet. It belongs to the deer family and is distinguished, first of all, by its rounded rough horns, which practically have no ramifications. 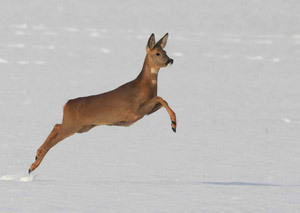 In addition, roe deer have a tail and a more dense body structure compared to deer. 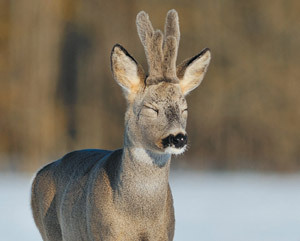 Roe deer are divided into 2 groups : Western Europeanand East Siberian . The horns of animals of the first group rarely reach a length of 30 cm, but the horns of the second can reach up to 45 cm. 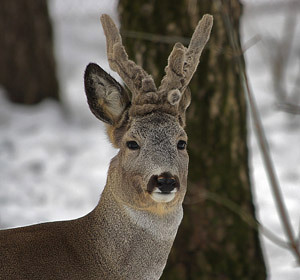 Earlier, East Siberian roe deer lived mainly in forest-steppe areas, but agricultural development and hunting forced the animals to move to the north. Currently, they can be seen in the Caucasian mountains, in Siberian forests, in the taiga. The habitats of roe deer include coniferous – deciduous forests, thickets of reeds, river areas . In winter, they have a dark – brown color, in the summer – light gray. In terms of weight, western European deer are inferior to Siberian ones, the males of which can reach 59 kg. Roe deer are fed in the summer mainly by various grass. In autumn, they are attracted by ripe berries and fruits. In winter, the ration of roe deer becomes poorer: they begin to feed on dry grass, extracted from under the snow, with moss, lichens, tree buds, acorns. During the day, roe deer needs drinking water, so they, as a rule, do not go far from streams and rivers. Roe deer is a sedentary animal . The territory of its permanent residence usually does not exceed 2 hectares. However, in the cold season, these animals have to move to places with little snow, where it is easier to get food. In the autumn season, roe deer unite in mixed groups of about 30 individuals. In the spring they return to their former places. In early summer, roe deer begins rut . It ends in late autumn . The males in this period are fierce. With rivals they can fight to the death. The females they pursue to the last of their forces. After covering one, they begin to race for another. After the rut is completed, roe deer form groups for the autumn transition. Pregnancy in females can last from 6 to 9 months. Under favorable conditions, the fetus develops quickly. In severe cold or when the female is fasting, the development of the fetus is suspended until the necessary conditions are created. Calving occurs in late spring – early summer . Usually, 1-2 babies are born, rarely 4 babies. They spend the first week lying down. After that, they begin to go after the mother and keep with her for the entire first year. At the age of three roe deer reaches full maturity. Life expectancy of roe deer – males is about 16 years, females – 12 years. There is no one way to hunt a roe . The most common are: hunting with decoys, with towers, paddock, battue hunting and hunting with hounds. The advantage of hunting from the tower is that the hunter sees the beast before, without disturbing him. To the animal, on the contrary, it is much more difficult to sense the danger. The towers are erected on the edge of forests and fields, at intersections of glades and forest roads, at coppices, on forest edges. On one tower there can be 2 people, no more. Used when hunting from the tower rifled weapons, at least – shotguns. This type of hunting allows you to kill only one animal. The rest after the first shot scatter. In order for such a hunt to be successful, you need to know the terrain and, in particular, the favorite places and animal trails. The main difference between hunting and hunting hunting is the number of participants. Up to 10 hunters , who become numbers, and as many beaters participate in the hunt-up hunt . In a hunting pen, the number of first and second does not exceed 5 people. Beaters are moving at a distance of 140 meters from each other, forming a semicircle. These conditions are created so that the animals do not jump between the beaters, and sent to the numbers of hunters. The optimal distance for shooting in a hunting hunt is about 40 meters . The neck and scapula areas are the most destructive places for roe deer It is best to use with the cartridges equipped with grapeshot 6 – 7.5 mm. Slowly chasing dogs are suitable for this type of hunting . Roe deer are not afraid of such hounds, so they return to their former place by making a small circle. Suitable for such hunting dachshunds. They have good flair and toughness. The hunt usually begins at dawn. Select the place of the animals. It can be forests, mountain passes. It must be remembered that if the roe deer are new, after the rut they may not return. Smooth-bore weapons . Used when shooting roe deer at short distances. The charge of grapeshot carries a few slaughter particles, which increases the chance of hitting the animal. The only drawback of this type of weapon is the limited distance. Rifle . From this weapon it is good to have a carbine of large caliber. His bullets give a strong pain shock, which precludes the care of the animal. When using a rifle weapon, the wounded animals are not passable. The bullets fired from such a weapon will ricoche against the most minor obstacles. Therefore, rifled weapons should be used in open areas. It is not recommended to use this type of weapon in densely populated areas. This is due to the range of the bullet and the long preservation of its destructive power. In order to hunt a roe, you need to get a license . This document is issued by state agencies that control the use of the animal world of our country, compliance with the rules and timing of hunting.